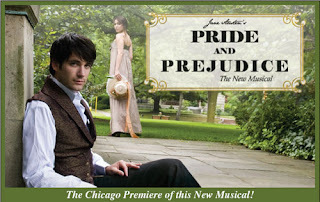 Really jealous that Chicago fans get to watch Pride and Prejudice the musical! The lead male on the post looks yummy. If any of you are going to watch it, do share with me your thoughts. In Jane Austen’s Pride and Prejudice: A Musical Play, Jane Austen revisits her rejected first novel, First Impressions, and overcomes all obstacles to transform it into the timeless classic, Pride & Prejudice. ee Elizabeth and Darcy’s romance come to life from a whole new perspective and immerse yourself in Austen’s creative process as she interacts with the very characters she has created. Jane Austen as a musical! The idea never crossed my mind, but it did cross someone's. How interesting. Maybe it'll be a hit then go on the road. Gee, I'm thinking like Helen, this is sort of a new idea for me. But, why not? It's a great story, and if music can enhance it, so much the better. Just as I never imagined a musical with an actual plot that included scads of ABBA songs, I'd never dreamed of a Jane Austen musical. Why not? I ADORE musicals and love Jane Austen. Wish I could go see. But like Helen, I'll hope it's a smash that goes on the road. Being the accomplshied world traveler that you are, just hop on a plane and mae a vacation out of it. But you might want to wait until it warms up a bit. Chicago this time of years is cold cold cold. Yes, I would love to attend this musical. But travelling to America is getting very troublesome now. Maybe there is sound track available.